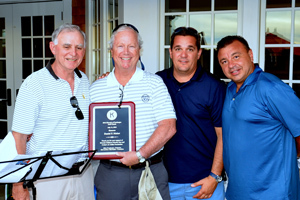 The Kiwanis Club of Patchogue sponsored its annual Golf Klassic at the Baiting Hollow Golf Club on July 11. Golfers from the tri-state area participated in the event honoring Dan Maher for his support of research for Pediatric Crohn’s Disease provided by the Crohn’s & Colitis Foundation. The tournament’s proceeds went to this foundation as well as to Patchogue Kiwanis’Children As Priority One mission. Mr. Maher is the Executive Director and Chief Operating Officer of the Excess Line Association of New York. His strong support of Crohn’s & Colitis Foundation started when his daughter was diagnosed with Crohn’s Disease which is a lifelong, chronic autoimmune disease that affects the digestive system. Awarding a Kiwanis plaque of recognition (from the left) is Kiwanis Tournament Co-chairman, Phil Muller; honoree, Dan Maher; Mark Charvat, President of Patchogue Kiwanis; and Tournament Co-chairman, Mike D’Ambrosio. Tournament Co-chairman, Robert Lawless was unavailable for the ceremony.